Sam joined the Civic Consulting Alliance as an analyst in July of 2018. He works on the Public Safety and Criminal Justice platform. Before coming to the Civic Consulting Alliance, Sam worked at the Heartland Alliance’s Marjorie Kovler Center and the Field Museum. He also studied abroad in Hakodate, Japan to improve his Japanese, which he studied for four years in college. Sam was born in Austin, Texas, but has lived in Chicago since 2008 where he graduated from the University of Chicago in 2018. He graduated with a B.A. in Political Science for which he received departmental honors. 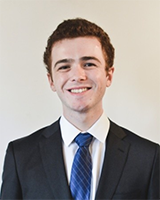 Unsurprisingly, Sam enjoys following politics and world news, but he also enjoys playing basketball, visiting art galleries, attending concerts, and seeing plays in Chicago.